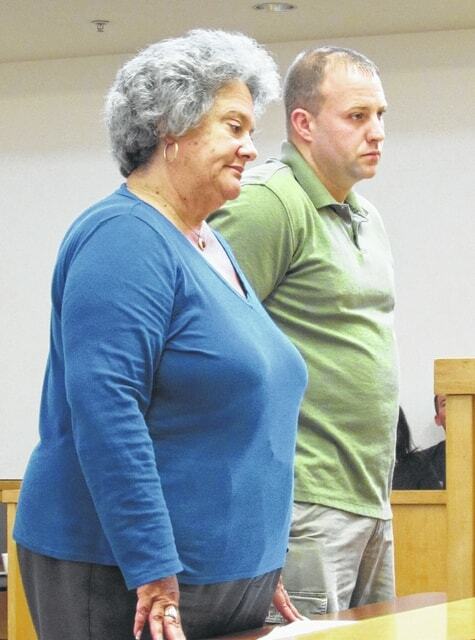 Jason Snider is pictured with defense attorney Lynn Turner in the Hillsboro Municipal Court on Friday. Sentencing for a Hillsboro man charged with child endangerment was deferred as per a plea agreement reached in the Hillsboro Municipal Court on Friday. The Times-Gazette previously reported that Jason Snider, 34, was charged with the first-degree misdemeanor after allegedly kicking a cell phone that injured an infant. On Friday, Snider pled guilty to the charge, and sentencing was deferred until August to give him time to complete anger management classes. Defense attorney Lynn Turner said he was currently engaged in those, and that he had pursued them voluntarily. If those classes are complete, the charge will be amended and reduced to disorderly conduct. In other cases, Jamey Wamsley, 37, Washington Court House, appeared on a bench warrant and was sentenced to 90 days in jail. Court records show that a warrant was issued for his arrest in 2013 on a charge of first-degree misdemeanor theft. On Friday, Wamsley pled no contest to the charge and was found guilty, according to records. Half of a 180-day jail sentence was suspended. Records add that Wamsley can be furloughed on Monday. He is ordered to return to court in January. Wamsley must also obtain counseling from Woodhaven in Dayton. He was placed on reporting probation. Also on Friday, Jamison Doyal, 40, Hillsboro, appeared on nine charges of attempting to purchase an illegal amount of pseudoephedrine, all second-degree misdemeanors, according to records. Defense attorney J.D. Wagoner told the court that Doyal declined an offer from the state. Records add that a demand for a trial by jury was filed. Also, Doyal’s bond was reduced to his own recognizance (OR) following a request by his attorney. While his case is pending, Doyal is to have no contact with Walmart or Walgreens. He must also observe a curfew. Doyal was released from custody on Friday. He is scheduled to return to court on July 30. Two other defendants also appeared on pseudoephedrine charges, with both entering agreements. Brittany Smith, 35, Greenfield, pled guilty to the charge. The state recommended a suspended sentence on the condition that she stay out of Walgreens. The judge added that, according to a note from the prosecutor, Smith is currently in treatment. “Who are you selling it to?” McKenna asked. “Anybody who will buy it,” Smith said. “So you’re just another drug dealer?” the judge asked. “Then you looked at it wrong,” McKenna said. A 90-day jail sentence was suspended on the conditions of the agreement. Smith will be on a curfew until her counseling is complete. She was placed on reporting probation. A 60-day jail sentence was suspended on the condition that Frayley get an assessment and any recommended counseling at FRS. A $750 fine was also suspended. He must stay away from Walgreens. An agreement was also reached for Jeffrey Williamson, 28, Latham. He pled guilty to second-degree misdemeanor criminal damaging. A charge of receiving stolen property was dismissed. In reviewing Williamson’s record, the judge said Williamson had served time in prison. As per the agreement, a 90-day jail sentence was suspended on the condition that Williamson pay restitution. He must also complete 60 hours of community service. Williamson was placed on reporting probation. He will be on a curfew until his community service is finished and the restitution is paid. Multiple charges against a Hillsboro man were dismissed due to a recent prison sentence. The Times-Gazette previously reported that Ryan West, 24, faced a total of eight charges in the municipal court following a May crash. He had reportedly told a responding deputy from the Highland County Sheriff’s Office that “he had shot up with heroin prior to the accident,” according to an affidavit. His charges included four counts of receiving stolen property, all first-degree misdemeanors; one count of operating a vehicle under the influence (OVI), also a first-degree misdemeanor; driving without consent, a first-degree misdemeanor; possession of drug abuse instruments, a second-degree misdemeanor; and failure to maintain control, an unclassified misdemeanor. Last month, West appeared in the Highland County Common Pleas Court, as previously reported. He admitted to probation violations and was sentenced to 11 months in prison. He will be given credit for time he spent in the STAR program. Charges were also dismissed for Travis Gibson, 35, Hillsboro. The Times-Gazette previously reported that Gibson entered an agreement and pled guilty to two counts of theft. Sentencing was deferred to give him time to pay restitution. Records show that Gibson was compliant. Both charges were dismissed. Finally, a $1,000 bench warrant was issued for Benjamin McGraw, 54, Greenfield, after he failed to appear for a pretrial. Records show that a he is charged with aggravated trespassing and aggravated menacing, both first-degree misdemeanors. Photo: Jason Snider is pictured with defense attorney Lynn Turner in the Hillsboro Municipal Court on Friday.